Traub Design Associates - "I Knew It was a Fine Country"
stagecoach stop along the Santa Fe Trail. The city-owned site operates as a living history farm. 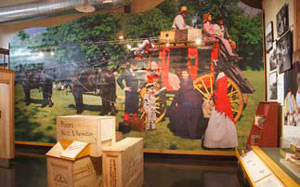 In April 2008 a new visitors center allowed the staff to move offices and gift shop out of the historic home and create a museum space devoted to the farm’s storied past. The 15-month exhibit project combined both original photography and historical photographs with the extensive primary research that was provided by the client. The in-depth research was successfully incorporated through a variety of techniques: primary and secondary labels, rail labels and six flipbooks that were distributed throughout the space. Recreated period posters offer the visitor a quick summary of key events in the life of the Mahaffie family. platforms or recreated wooden shipping crates. Exhibition Size: 1400 sq .ft.